For many years, it seemed that the Navarroné-P sons, Eternity Ibn Navarroné-D and Escape Ibn Navarroné-D, won every championship at every show across Europe. These two white stallions captivated audiences and it seems like only yesterday that they were showing everyone how it was done. Hard as it is to believe, Eternity is now 19 years old, Escape 17, and they are the veterans of the Arabian showing world. 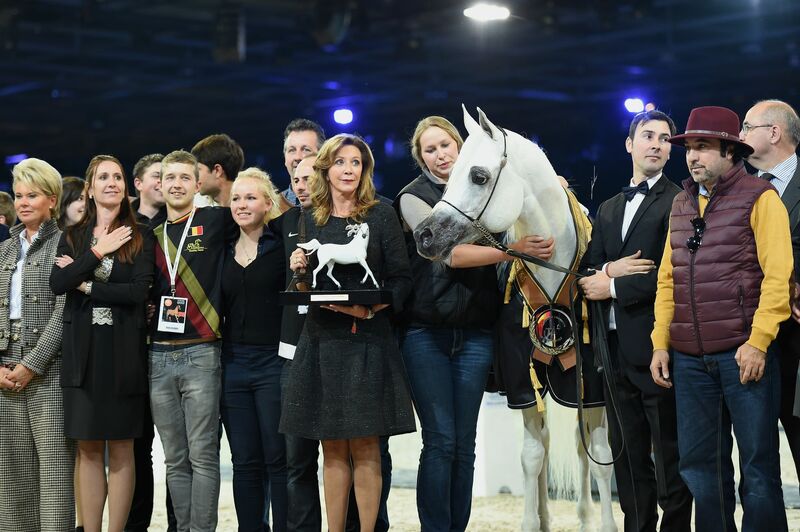 However, Eternity Ibn Navarroné-D made a triumphant, and powerful, return to the show-ring in Paris last November. There, he earned the title of Platinum World Champion Stallion. This is his story. Both Eternity Ibn Navarroné-D and Escape Ibn Navarroné-D, now owned by the Ajman Stud, were bred by Martine Van Hee of Dion Arabians, Belgium. Their dam was the incredible mare, Navarroné P. A true Dam of Distinction, Navarroné created an amazing legacy at Dion Arabians, and she sadly passed away last year. However, Martine’s grief at ‘Poppy’s’ passing would be tempered in November as her beloved Eternity took the Platinum Stallion title. Eternity Ibn Navarroné-D with Martine and some of the Schoukens Training Center team in Paris. From the moment that he was born, Eternity has very much been at the heart of Dion Arabians. Navarroné’s story is one that has been told several times in these pages over the years; suffice to say, Martine discovered her when Navarroné was a young mare and she immediately recognised the potential in her. A beautiful grey, with huge eyes that underlined the Spanish influence in her pedigree, Navarroné was truly the beating heart of Dion Arabians from the moment that she arrived at the farm in 1991. Her sire was El Khidar P (Ibn Estopa x Khadirah by Mubark), whose sire in turn was a full brother to the world-changing El Shaklan, both being sons of the immortal Spanish mare Estopa (Tabal x Uyaima by Barquillo). These Spanish lines are further infused through Navarroné’s dam, Navarra P (Jalisco x Cerva by Esmir), whose pedigree contains two lines to Tabal (Congo x Hilandera by Gandhy). With such precious bloodlines, Martine chose carefully when looking for a stallion to put to Navarroné for her first foals for Dion Arabians. “I spent my time to find a stallion that would complement Poppy’s special qualities,” explains Martine. “In the end, I chose Ansata Sinan and in 1996, she foaled the graceful mare Sarai Bint Navarroné-D. I was thrilled and bred Navarroné back to Sinan for a 1997 foal – the result was Eternity. Martine with her beloved Navarroné-P. Certainly, the cross of the straight Egyptian Ansata Sinan over the very Spanish Navarroné was a potent one. Ansata Sinan’s sire was the great Prince Fa Moniet (The Egyptian Prince x FA Moniet by Ibn Moniet El Nefous), while, including himself, his damline represents six generations of the Ansata Stud breeding programme. The dam in question is Ansata Nefara by the great Ansata Halim Shah (Ansata Ibn Halima x Ansata Rosetta by Ansata Shah Zaman). Ansata Nefara herself is out of Ansata Sudarra (Ansata Abu Sudan x Ansata Delilah by Ansata Shah Zaman). As well as being a great show horse, Eternity has also proved himself as a great sire. While he won all three Triple Crown titles, he didn’t do so in the same year but while this is one title that escapes him, Nijem Ibn Eternity (ex Naravna by Narav Ibn Aswan out of Nenija by Neman) did take that coveted European Triple Crown title in 2004. Also of note, and featured in this edition, is Mukhtar Ibn Eternity (ex Monsoon by Djamaal out of Mahleika by Maleik El Kheil), a 2004 stallion that just took part in the All The Queen’s Horses Parade through London on New Year’s Day. Eternity loved his return to the show-ring with Tom Schoukens. Last summer, Eternity made the move to nearby Schoukens Training Center, where he is available at stud this season. 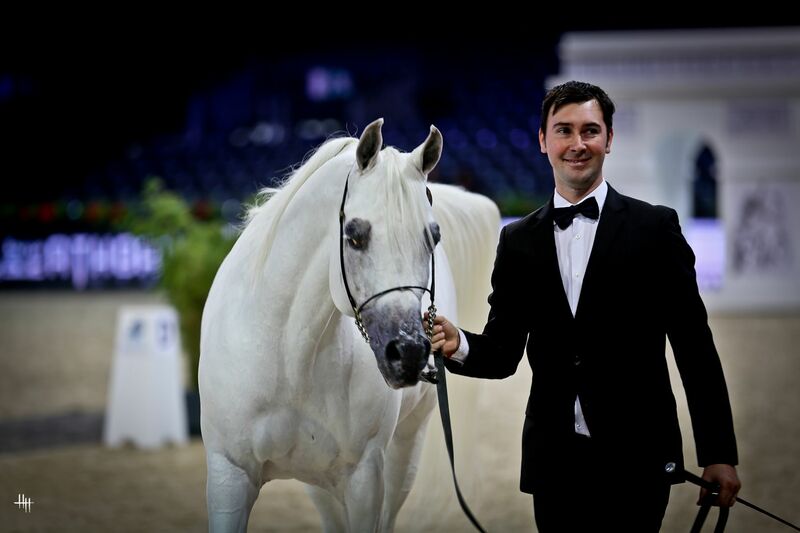 Tom Schoukens commented how well the stallion was looking and so it was decided that it would be fun to take him back to Paris for the Platinum World Championship. “This decision gave Eternity the opportunity to come out of retirement, as well as visit the most famous show-ring in the world one more time, and he loved it!” smiles Martine. Watching this magnificent grey stallion come into the arena, I can attest that it was an incredible moment. He absolutely lapped up the attention and the cheers, and it truly was a goosebump-inducing moment, one that will live on for eternity in the hearts of all that witnessed it. It was so special to see this great stallion return to the ring later with Pinga (Gazal Al Shaqab x Pilar), the Platinum World Champion Mare, and parade together. Memories truly are made from occasions such as these. Martine with Eternity Ibn Navarroné-D.
“It was so wonderful to see Eternity in the ring again,” says Martine. “Thank you to Tom, Cathy, Glenn and the whole of the Schoukens team for their support in making this happen. In fact, it has inspired me to begin showing again – something that I considered stopping after the passing of my precious Navarroné last summer. 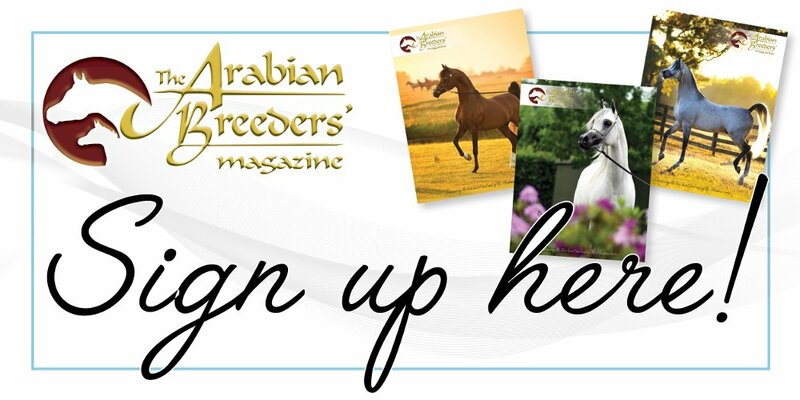 Certainly with peoples’ minds full of Eternity, and then with My Fair Rose returning to the show-ring, it is clear that 2016 marks the start of the next generation for Dion Arabians, the next chapter in what is now a 25 year plus story. Martine works hard to balance the history of the past with the expectancy of the future, and I am sure that I am not alone in looking forward to what comes next for the horses of Dion Arabians.